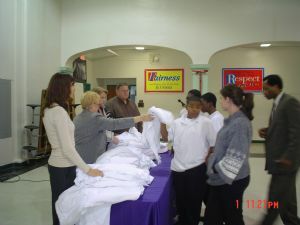 An annual project for Rotary South is distributing brand-new white sweatshirts to every student at Douglas Alternative School. The school dress code requires white shirts and black pants, and not every student has an option other than a white t-shirt. Since 2004, Rotary South has been providing new white sweatshirts to every student at the school to help them stay warm during cold weather. It's easier to concentrate in school when you're warm!